I've heard it said that a person's first memories can sometimes date back as far as before their first birthday. In my case, I think I was around two and my earliest recollections seem to involve bedtime instances with my mother. I can recall her love and tenderness so very clearly... and still fondly remember moments when I'd stick my fingers out from the spindles of my crib, reach and call out for her hand. She always responded patiently by holding my small hand in hers until I fell asleep. My baby bed in the old Hoosier farmhouse was in my parents' bedroom, near a window facing the South from which I could look up and see the stars against the clear night sky. I especially remember a warm summer night when the window was open, and could feel a cool evening breeze and hear crickets chirping. 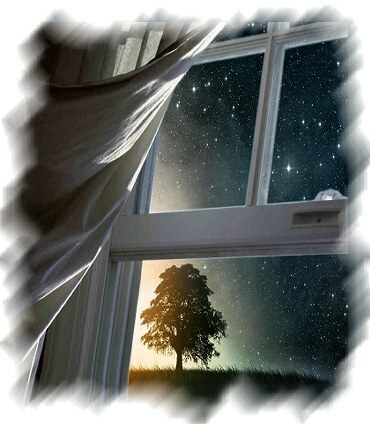 Peering upward beyond the silhouette of an old shade tree, I could see numerous bright twinkles in the sky, and I remember her saying in her sweet soft voice, "I love you more than all those stars up there." She Made Sure I knew She Loved Me - To hear my mother talk to me as an infant, was all quite fascinating for my little mind. And while I obviously didn't understand everything she was saying at first, she repeated these and similar thoughts about her love for me over many months until I eventually began to comprehend how much I meant to her. I knew nothing about comparing worth or measuring values, but in time I came to realize she was saying that her love for me outnumbered the infinite number of all those beautiful twinkly things in the sky. It’s an awesome thing to feel loved, and especially to treasure this as one of my earliest memories in life. Never once during my childhood, nor during my early years as an adult, did I ever question whether I was loved or wanted by either my mom or dad. I always knew that regardless of how unlovable I had sometimes been, their love for me was unconditional and forever. Being made to feel loved and valued, may be the most substantial thing that any parent can convey to their child. And I know for me, this was the most important foundation of my understanding of God’s love, and helped shape an early attitude of compassion and empathy toward other people around me. 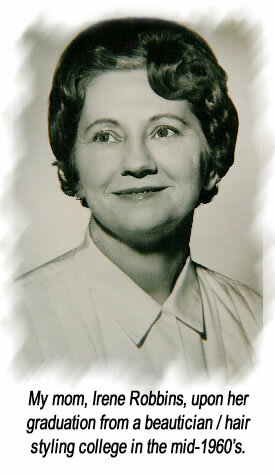 Her Love Was Fair and Impartial - In my mother’s thinking, God’s love was equal and impartial toward all mankind. Just like she and dad loved all of their five kids equally, God loved all of his children equally too... regardless of appearance, shape, color, social class or abilities. She taught us that no one should be looked down upon for such reasons, but that all people should be shown as much respect, love and kindness, as anybody else. I can only remember one conversation I ever had with my mom about race, when I was in the second grade. While our rural farming community didn't have much racial diversity, there was one little African-American girl in my school class, who had become one of my good friends. Although I never felt any concern about the difference of her appearance, I sometimes wondered why she and some other people were not the same color as me. Mom didn't hesitate at my question, but seemed to have an answer already figured out. She told me how that God created everyone as equal in His sight, even though some of us look different than others... and illustrated this with sheets of cookies that she had taken out of the oven. Some cookies had been left in a bit longer than others and had varying shades... ranging from a light tan to dark brown. She explained that though God made us all from the same dough and were the same inside, some of us were simply left in the oven longer and came out looking slightly different. I seemed to think the issue of race was pretty simple, that what God placed inside a person was more important than the shade of their skin. So since both my mom and God seemed to love all people equally, regardless of their outward appearance... I figured it must be okay for me to feel the same way. And so I did... and I’m grateful today that I never grew up with the same hateful biases or prejudices that many other kids learned from their parents. Her Love Was Compassionate - My mother’s love for the innocent and defenseless, also made a huge impact on me. She was gentle and kind both to people and animals, and even to the livestock on our small farm... a difficult thing when most are raised to be sold at market or slaughtered for meat. When I was small, she occasionally slaughtered some of our chickens for family meals, but eventually couldn’t bring herself to keep doing it. As she once explained to me, when she saw severe injuries or wounds to people or animals, she would experience what she called “sympathy pains,” something I sometimes experienced too, like I could feel the pain of someone else who was suffering. Many of our farm pets, several dogs and many cats, could sense her compassionate heart and often followed her around, hoping for a gentle stroke on their head, or for the sound of her kind words. And even though beef and poultry always remained a part of our meals... including an occasional squirrel or rabbit brought home from hunting in the woods, her example taught me that all creatures were to be treated with respect and kindness, and not needlessly abused in any way. I especially remember an instance when I was about three or four, playing roughly with some of our cats. I didn’t intend any harm, but thought their long tails were merely something handy to grab and swing around in a playful manner. They, of course, didn’t feel the same way, and fled from me, hissing and spitting in terror. Our older dog, Buster, was too big for any similar treatment, but had apparently watched my disturbing idea of fun with cats, and was wary of me getting too close. Nonetheless, I tried playing with him too... and made the mistake of putting my face too close to his, which he apparently took as a threat. The no-nonsense farm dog was having none of this, and rared up with a growl, biting me squarely across the face. Shocked and frightened, thinking that Buster had bitten my face off, I ran crying into the house... where mom comforted me. After looking me over, she realized that the old dog’s bite was just a warning nip to the little cat-abusing brat, and used a mirror to show me that he had not drawn blood or left any marks. Fortunately for me, Mom was able to use this skirmish with Buster to teach me kinder and gentler ways of playing with animals, and to understand their ways of defending themselves when feeling afraid. She showed me that all life is precious, and even if hunted for food or raised as market livestock, all of God’s creatures should be respected and treated fairly. I eventually got it right, made up with Buster, and enjoyed growing up with many critters and pets that I loved and cared for. Looking back on those years, I realized that God used these little creatures, along with my mom’s loving example, as a training lab for me to learn how to deal with and treat people as an adult. Animals respond predictably, favorably and loyally to our kindness, our rewards, our approval... and so do people. And just as animals recoil and lash out when they’re afraid or mistreated, so do humans. Her Love Was Unconditional and Forgiving - Finally, my mother’s unconditional and forgiving love is what I will always remember and cherish most about her. In today’s society, more than half of all marriages end in divorce... the average duration of which is a little more than eight years. 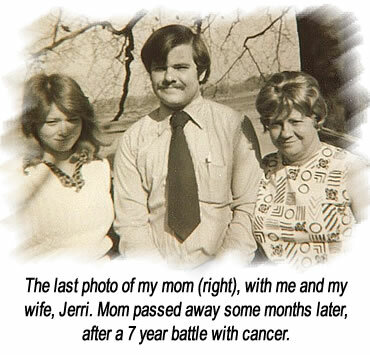 In contrast, mom and dad’s marriage lasted 42 years... until she died, just a few days shy of her 62nd birthday. However, this longevity doesn’t mean that their marriage was always blissful, or that they got along perfectly. There were many hardships, moments of hurt and disagreement... but they lasted so long together because of respect for their sacred marriage vows, and because they both were committed to idea of love and forgiveness. Mom could certainly get angry on occasion, and could be pretty stern. As a child, I can remember more than one occasion that she spanked me with a switch she grabbed up in the yard from a fallen branch. And I can even remember instances that she demanded me to go fetch the switch that she would use on me (which of course, would generally be the smallest and least painful I could find!). But her anger didn’t last long, and she would soon wrap me in her arms and tell me how much she loved me again. I eventually figured out that her spankings hurt her more than it did me, and she only disciplined me because she loved me. Love doesn't let your kids get by with everything, but love holds them responsible... by correcting them, even with painful discipline when necessary. Regrettably, in my later years as a young adult, I deeply hurt both my mom and dad with an outburst of rage and disrespect when they challenged the perdicious lifestyle I had adopted. I parted ways from them with bitterness and hatred, expressing the kind of words and actions that usually end relationships. However, it wasn’t long that tragedy and difficulty caught up with me... but instead of letting me languish in my affliction, mom reached out to me in love and forgiveness, which melted my heart with remorse for how I had treated them. Her continued love and persistent prayers, is what turned my life around, which God used to bring me into a relationship with my Savior, Jesus Christ. My mother made it clear to me, that her love for me was unconditional... that is, regardless of what poor decisions I made in life, or even whether I chose not to love her back, she would always love me and forgive me, no matter what. There could be no greater example of God’s kind of love, who loved us in the same way... sending Jesus to suffer and die, offering forgiveness for our sins... even while mankind was still rebellious and evil. My mom, Irene Robbins, was a devoted follower of Christ, and graduated to Heaven many years ago after a long battle with cancer. But she lived long enough to see many of her prayers answered, and for the Lord to bring her youngest son back to the Lord. I will forever be grateful to God for giving me such a precious mom, and will cherish always her remarkable love, her forgiveness, and the values that she and my dad passed on to me and my siblings. This article (VL-622) is copyrighted © by Dr. Dale A. Robbins, 1990-2019 and is a publication of Victorious Publications, Grass Valley, CA - Nashville, TN. Unless otherwise stated, all scripture references were taken from The New King James Bible, © Thomas Nelson Inc., 1982. You may download this article for personal use as long as you retain credit to the author. Obtain permission before reproducing copies for any reason, by filling out our simple use permission form. Many of our writings are also available as free pdf tri-fold pamphlets, which can be downloaded for reproduction from our Online Catalog. For media reproduction rights, or to obtain quantities of this title in other formats, email us. If you have appreciated these online materials, help us reach the world with the Gospel by considering a monthly or one-time tax-deductable donation.